If you've read Louisa May Alcott's beloved classic, Little Women, this novel is for you. March is a novel told from the point of view of "Father March," Marmee's husband and Meg, Jo, Beth, and Amy's father who went off to join the American Civil War. So, except for a brief homecoming, Father March was largely absent from Alcott's novel. In this work, he tells of how he and Marmee first met and eventually married, their struggles and beliefs as they joined the abolitionist movement and served the Union, and how his work as a Union chaplain in the frontlines of the war nearly broke him and his family apart. It has been many, many years since I read Little Women. I also remember watching the film adaptation, which I liked. Little Women was basically about the March sisters and their mother, Marmee, so this novel narrated from the perspective of the only male March family member read like the final piece of the huge puzzle that is the life of the Marches. Father March started from scratch. Before he met Marmee, he sold books from plantation to plantation in Virginia, and on one of these occasions, he encounters Grace, an intelligent and literate young black slave. He develops a closeness with her until his desire to secretly teach a little black child her "letters" results in a tragic end for everyone involved; he gets transferred as a consequence and, from there, experiences the full extent of the civil war, finding himself fighting hard for the cause of the abolitionists and almost losing his life in the process. He contracts a debilitating disease and, instead of seeking full recovery and opting out of the war to reunite with his family, he is ridden with guilt and wants to vindicate himself for the lives lost because of him. I really liked this book because it imaginatively filled in the gaps in the March family story, and I liked the voice of Father March. I did not completely agree with some of his decisions - about the war, about how to spend their money, about wanting to rid his conscience of guilt - but I liked his humanity, his sincerity in the cause of the abolitionist movement, and the legitimate desire to eradicate slavery. Because he was a chaplain, I was predisposed to think that he would act with morality, but he showed that he was also only human and therefore, prone to commit mistakes. I thought that he was morally upright and headstrong, but in the face of war, slavery, and bloodshed, human frailty shows; who can blame him? 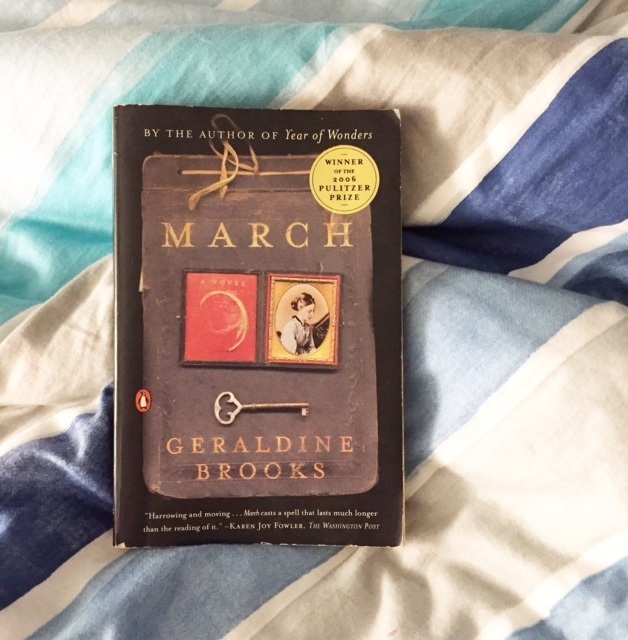 Geraldine Brooks writes with such exquisiteness and clarity that I was even more drawn towards Father March's story. If you are keen on picking this up but haven't read Little Women yet, please go ahead - reading the latter novel is not a prerequisite to reading March. It is a novel that can stand on its own and does not rely on the story told in Little Women, even if the March women make an appearance here. But if you have read Little Women (or have seen the film, at least), then consider it a nice bonus. Who is the brave man - he who feels no fear? If so, then bravery is but a polite term for a mind devoid of rationality and imagination. The brave man, the real hero, quakes with terror, sweats, feels his very bowels betray him, and in spite of this moves forward to do the act he dreads. And yet I do not think it heroic to march into fields of fire, whipped on one's way only by fear of being called craven. Sometimes, true courage requires inaction; that one sit at home while war rages, if by doing so one satisfies the quiet voice of honorable conscience.